Amanohashidate is one of Japan’s Top 3 views. Along with Miyajima and Matsushima, it is considered beautiful. In my previous posts, I have mentioned both Miyajima and Matsushima. I was awestruck by the beauty of Miyajima and let down by Matsushima. For the third year in a row, I went to visit one of Japan’s Top 3 views. This time, I went with no expectations at all. I was looking for a nice relaxing day and to just explore a remote area of Japan. Getting to Amanohashidate is much harder than Miyajima and Matsushima. Miyajima is difficult because you have to take a ferry. 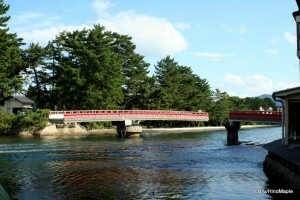 Matsushima is difficult because it’s located outside Sendai. Amanohashidate, however, is located far from Kyoto, and Kyoto is the nearest major city. 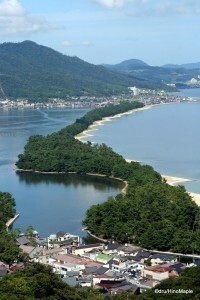 In fact, Kyoto is closer to the Pacific Ocean, and Amanohashidate is located on the Sea of Japan coast. If you are travelling from Tokyo, expect to travel for roughly 5 hours. Bring a fully charged iPod and you’ll be okay. 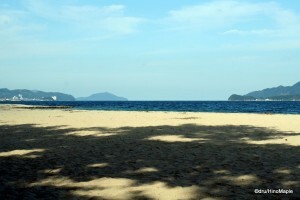 Amanohashidate is famous because it’s a 3 km sand bar. Translated, Amanohashidate means “Bridge in Heaven”. The most famous thing to do, when visiting Amanohashidate is to venture up one of the nearby mountains, stand with your back facing the sand bar, and look at it from between your legs. This gives the impression that the sand bar is actually in heaven, or heading to heaven. You can do this on both sides of the sand bar, and it isn’t too expensive to head up. When you do head up, be sure to take the chair lift. It’s one of my favourite things to do in Japan. These chair lifts are not like your traditional ski lifts. Rather, they are simple chairs with almost no safety features whatsoever. It can be a little scary at first, but it’s such a peaceful ride that you’ll feel almost as if you were floating in the chair. Unfortunately, the views of the sand bar aren’t great from the chairlift. If you head up from Amanohashidate station, you’ll have a little luck as the top of the hill has a small, and I really mean small, amusement park. It’s probably great for kids, but for adults, it’s nothing special. You can easily spend an hour just relaxing and taking your time wandering the area. When you finish looking at the sand bar and get tired of seeing the same static views, Chionji is the only notable temple around the station. It’s somewhat large for the population, but it isn’t bad. I’d say it’s worth checking out, and don’t worry about time. If you arrive on the late train, you’ll still have plenty of time to walk around the entire area as the first trains back to Kyoto aren’t until around dinner time. The temple itself, however, isn’t special. 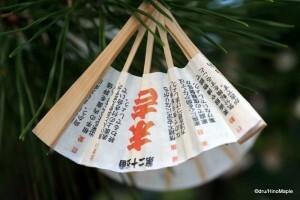 The main point of interest is probably the omikuji, fortunes. They come in small wooden fans which are pretty cute, and I’ve never seen them in that form before. From there, you can take a look at a type of key/lantern. Located next to the bridge leading to Amanohashidate is a key that looks similar to an Egyptian Key. Of course, it doesn’t look the same, but this key is supposed to bring luck for ships. Many people climb into it and enjoy a picture with it. Heading to Amanohashidate, you’ll have to cross a bridge. This is a famous point for photos. It’s an old swing bridge that opens up many times a day to allow the tour boats to pass. It’s nice for photos, but after you’ve seen it once, there isn’t much of a point to wait for it a second time. When you do cross the bridge, you’ll be on Amanohashidate. This 3 km sand bar is easily traversed by bicycle, but if you feel up to it, feel free to run across. It appears to be somewhat popular for locals looking for exercise to run up and down the sand bar. You could also go for a nice swim as the beach is quite beautiful. The water is very clean and there are various showers located along the beach. Do note that the showers are turned on during the summer season only. Also, be aware of traffic. The sand bar is closed to cars, but motorcycles up to 50cc are allowed and maintenance trucks may travel along the sand bar on weekdays. Located in the middle, there is a small shrine and various haiku passages. 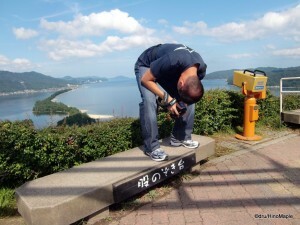 A famous Japanese writer was inspired to write several haikus while in Amanohashidate. If you didn’t bring your own bicycle, don’t worry. Just rent one from one of the many souvenir shops next to Chionji Temple. One of the last few things you can do is to take a boat ride to the northern shore. While I never did this myself, it looks nice and it’s a good way to burn time. The other is to head to the sento. There is a nice looking sento located next to the station. A sento is a Japanese public bath house. The prices for bathing in this sento are a little expensive, but apparently there is a free foot bath in front of the sento. If you need to pick up some gifts, Amanohashidate is famous for its black bean snacks. While this is not for everyone, it is an option, and some of them are delicious. They also have a few varieties of sake and shochu. Amanohashidate also has a regional beer, but I never tried it. Other than that, there really isn’t anything to do. I’d suggest bringing a picnic and enjoying it on the beach. Amanohashidate feels very remote and other than a few souvenir shops and touristy restaurants, there isn’t much to do. Once you’ve seen the sand bar, that’s it. Unlike the other two Top 3 views, there is much less to do here. I do feel that it ranks in at number 2 compared to Matsushima, but by and far, Miyajima is still the best. The best thing to do is to make the most of your time when you are in Amanohashidate. Enjoy being out of the big city. Relax at the beach. Read a book. Talk with your friends. Enjoy a beer on the beach. Do everything that you should do when you are on vacation, mainly relax! The Top 3 Views of Japan series continues with Miyajima, Matsushima, and Top 3 Views of Japan (Reflections). This entry was posted in Kansai and tagged Amanohashidate, Amanohashidate Station, bath house, beach, Bridge in Heaven, chair lift, Chionji, exercise, ferry, Hiroshima, iPod, japan, Japan views, Japan's Top 3 Views, kyoto, Matsushima, Miyajima, Omikuji, onsen, Pacific Ocean, picnic, run, sand bar, Sea of Japan, Sendai, sento, swim, swing bridge, tokyo, Top 3 Views, 京都, 仙台, 天橋立, 宮島, 広島, 日本, 日本三景, 松島, 温泉 by Dru. Bookmark the permalink. Hi! I live in Tokyo too and have been wanting to visit Amanohashidate since my first year here in Japan, any suggestion the best season to visit this place? I think anytime is a good time to visit Amanohashidate. If my memory is correct, I went in September. I find that is a good time to travel as the temperature isn’t too hot anymore. Basically, any sunny day where the temperature is good. Tokyo is a good barometer for most of Japan, aside from Tohoku and Hokkaido. Personally, I would go in Spring/Autumn, but that’s when I’d go anywhere in Japan. Have a good trip when you go.